GIVEAWAY! 2 Vintage Little Trendstar t-shirts up for grabs! We went through the archives and came across these gems from the past. Currently no longer available, these t-shirts are sure to never go out of style and we want to offer a chance for YOU to win one! 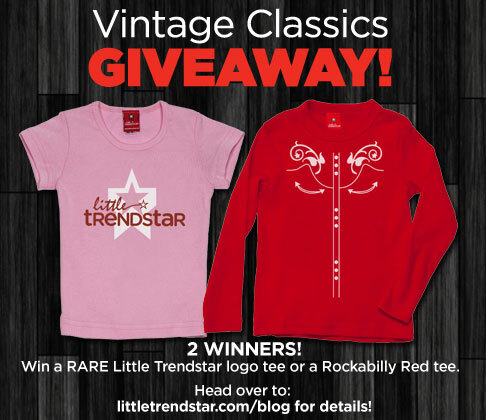 These two vintage classics are the Little Trendstar logo t-shirt in a pink girlie capsleeve style and the super rare red Rockabilly longsleeve. PLEASE NOTE: Due to the rarity of these finds, we are limited in sizes for the Rockabilly red. We have a 2T or 6T available only. To enter the Giveaway, leave a comment and let us know which of these two classics is your favorite! Also, head over to our Facebook Page and LIKE our page, if you haven’t already, or TWEET this giveaway on Twitter as well and we would be very happy! Post your entries in the comment section of this post. Winners will be picked randomly. Entries’ submission cutoff: Tuesday, January 22nd 2013, at Midnight EST. Giveaway is open to the residents of the US only. I LOVE the Rockabilly Red Tee! Def the red Rockabilly tee!!! Soooo cute! The LTS logo tee is awesome! Logo tee is so cute! My little girl is such a trendstar! ROckabilly Red all the way! I love the Red Rockabilly shirt!! My family loves Rockabilly music, so this would go perfect! Just adore the red shirt that looks somewhat like a cardigan, miss seeing color red on a lot of clothing! LOVE the Red Rockabilly Tee! !